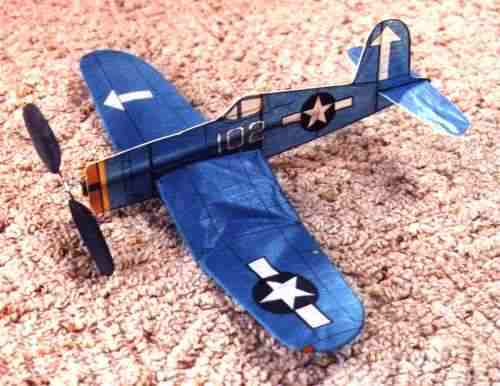 Model of the Chance Vought F4U-1 Corsair done in the markings of VF-84, USS Bunker Hill. A copy of the plan for this model is available for download from my plans page. These are "No-Cal" models. The term No-Cal refers to "No Calories" which describes the flat or profile structure for the fuselage. Power for this type of model is a loop of rubber. 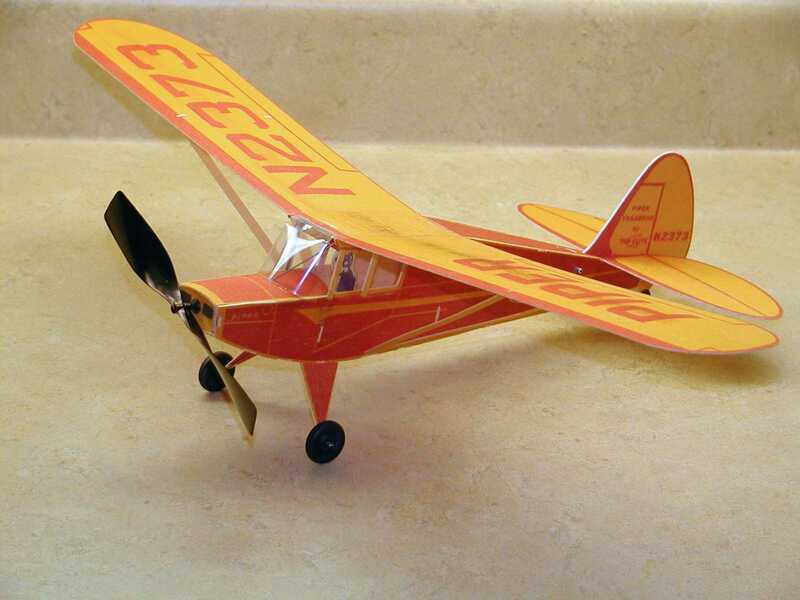 These models are easy to build, look like a real airplane while flying, and are capable of flights in the 3 to 4 minute range when flown indoors. 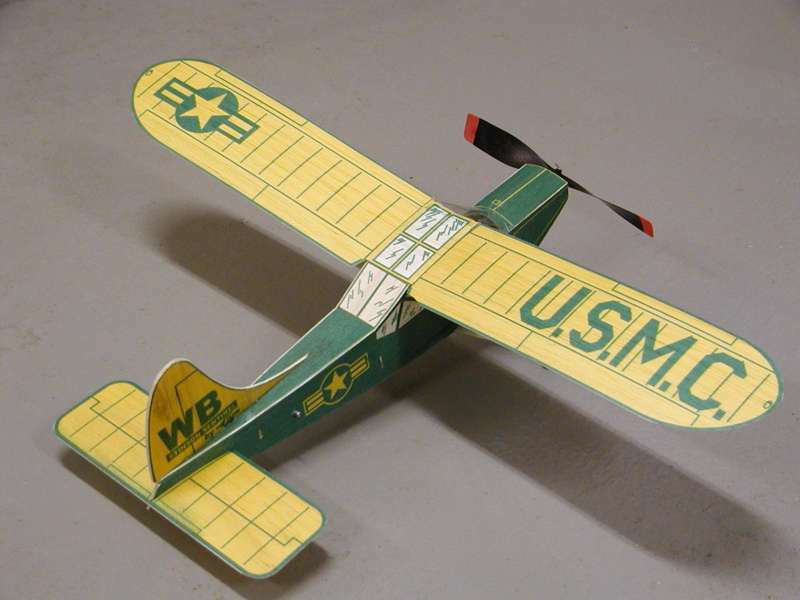 When flown in competition, the model must have a wing span limited to 16" inches, and must be recognizable as the full sized subject being modeled. Each of these models uses a motor stick made from a rolled balsa tube. The approach I use to make the rolled tube motor stick can be found by clicking here. A printed set of plans for the first eight models can be purchased from the Ezone. All of the No-Cal plans can be downloaded from my No-Cal plans page page. 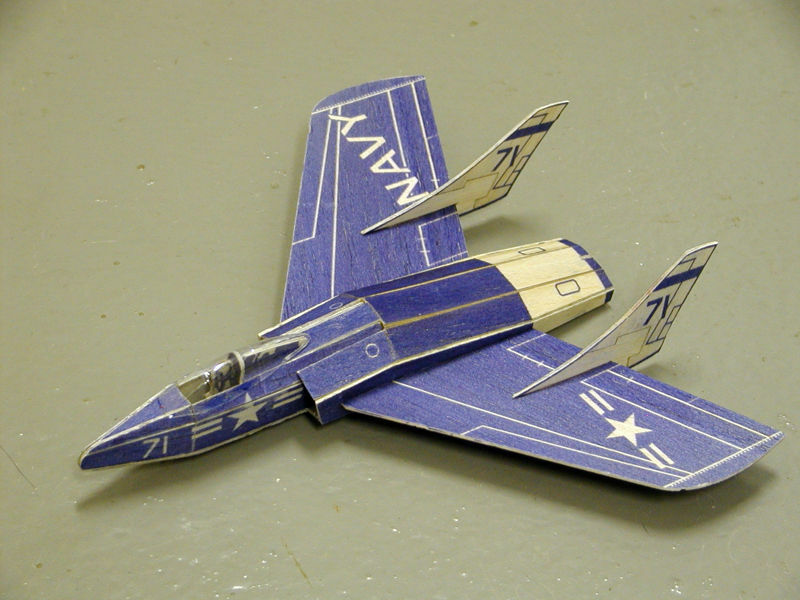 Model of the Grumman F8F-1 Bearcat in the Gulfhawk IV markings as shown by Al Willams. A copy of the plan for this model is available for download from my plans page. 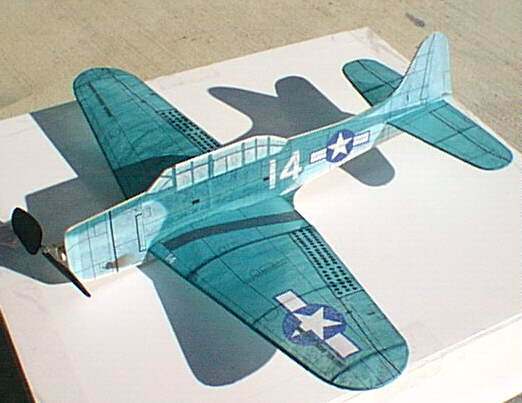 Model of the Curtiss P40F done in the markings of Col. Earl E. Bates of the 79th FG. A copy of the plan for this model is available for download from my plans page. 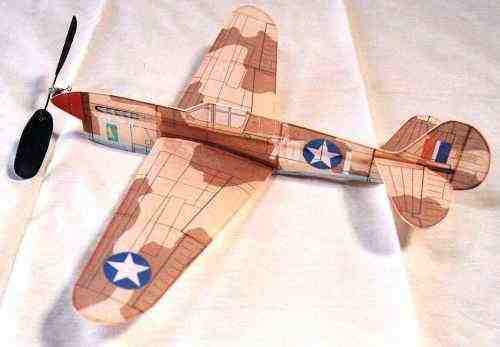 Model of the Republic P47D-25 done in the markings of the 82nd FS, 78th FGp. A copy of the plan for this model is available for download from my plans page. 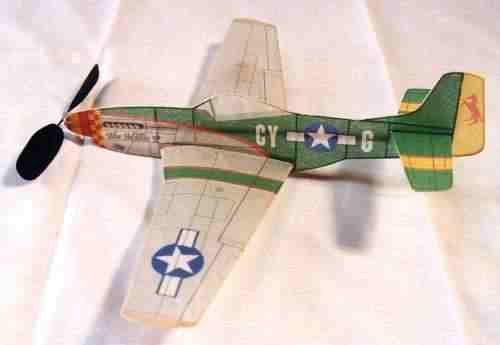 Model of the North American P-51D done in the markings of the 343rd FS, 55th FG flown by Maj Ed Giller. A copy of the plan for this model is available for download from my plans page. 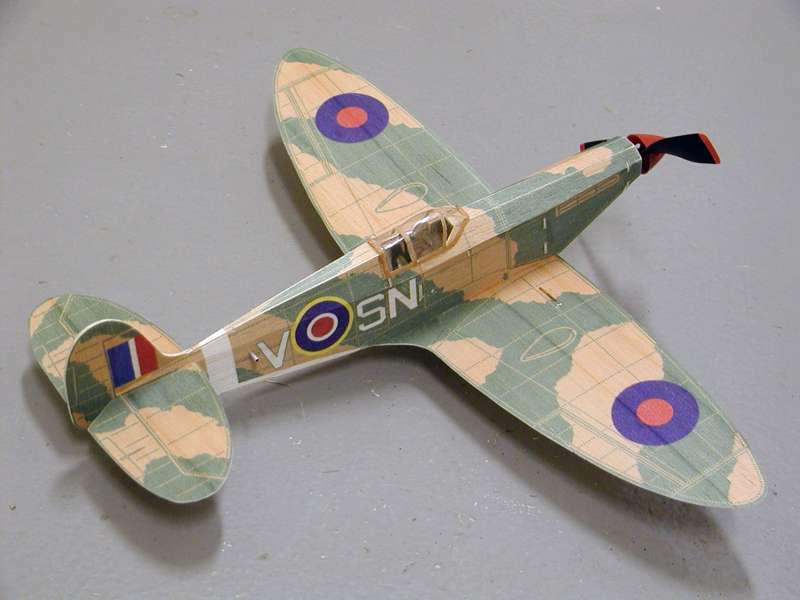 Model of the Supermarine Spitfire Mk Vb done in the markings of the No. 317 (Wilenski) Sqdn. A copy of the plan for this model is available for download from my plans page. 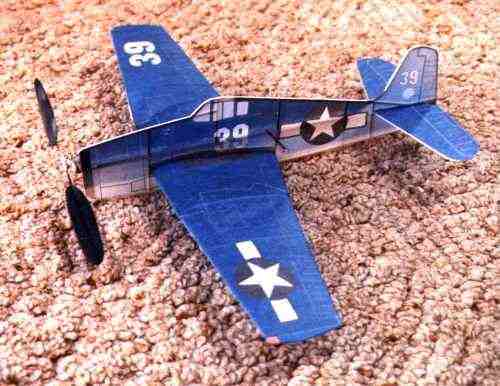 Model of the Grumman F6F-5 done in the markings of VF-76, USS Hornet. A copy of the plan for this model is available for download from my plans page. Model of the North American T-28B done in the markings of the Pacific Fleet All Weather Training Unit. A copy of the plan for this model is available for download from my plans page. 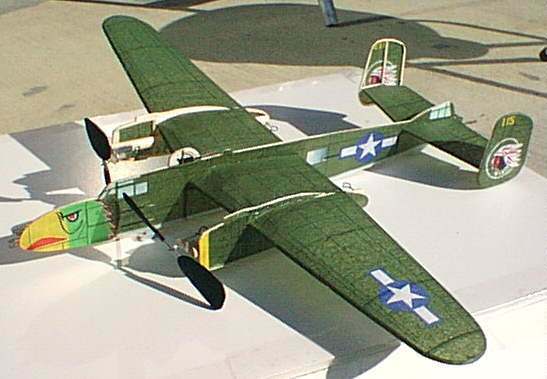 Model of the North American B-25J done in the markings of the 498th Bombardment Squadron ("Falcons"), 345th Bombardment Group. A copy of the plan for this model is available for download from my plans page. 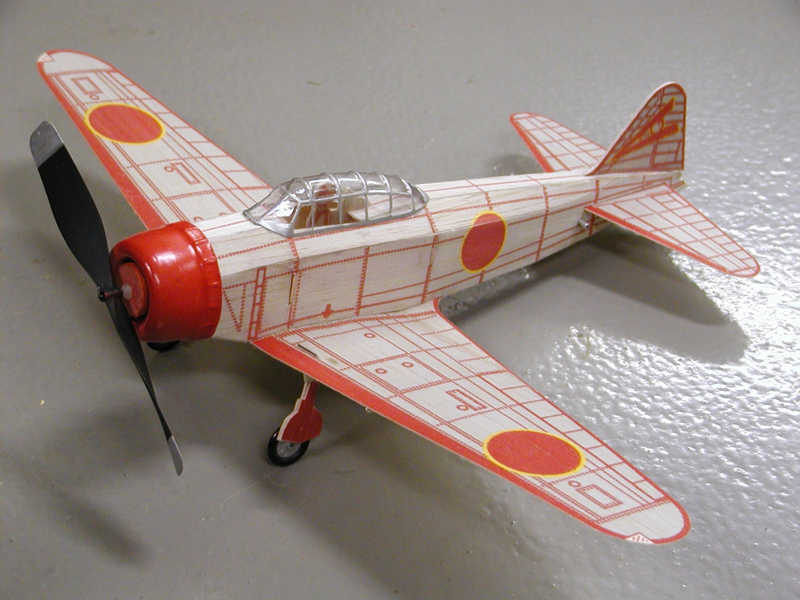 Model of the Kawasaki KI 61 "Tony" done in the markings of the 244th Fighter Squadron based at Chofu near Tokyo. A copy of the plan for this model is available for download from my plans page. 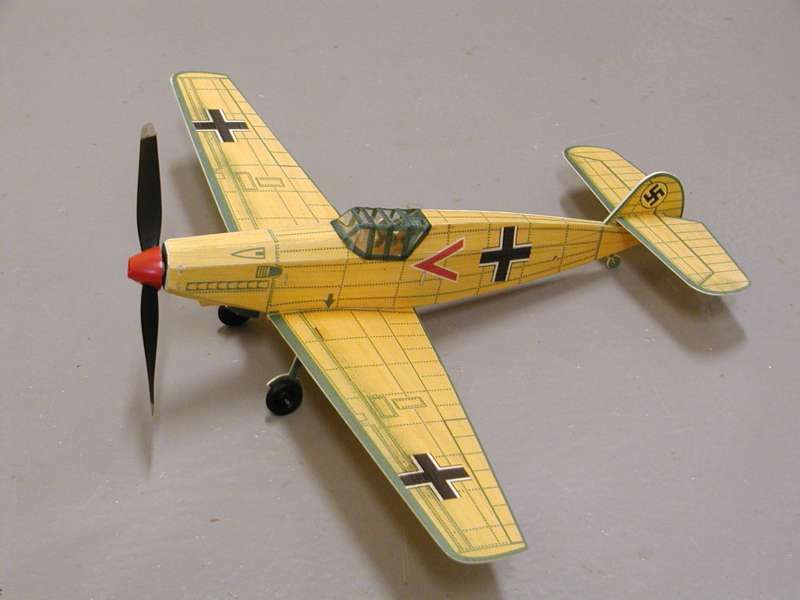 Model of the Focke-Wulf 190A. A copy of the plan for this model is available for download from my plans page. 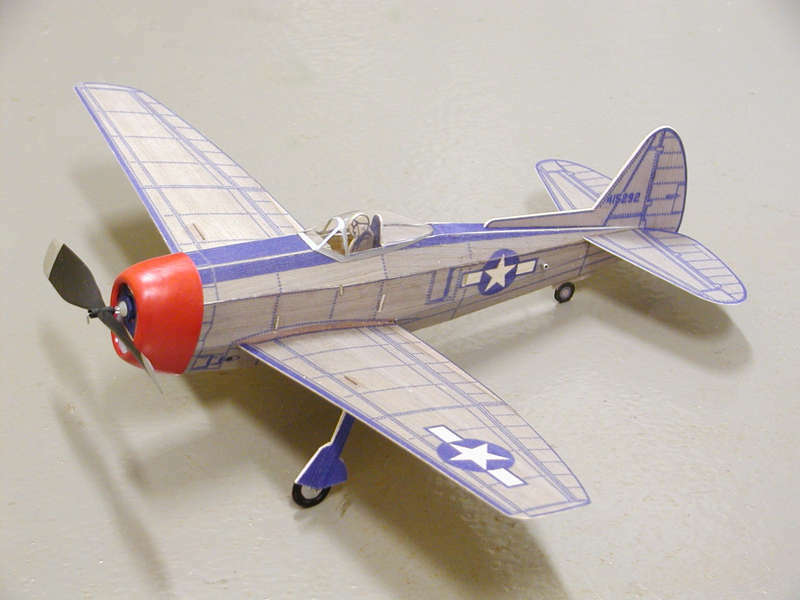 Model of the SBD-5 Dauntless. The markings are from VB-5 on the Yorktown, Wake Island, October 1943. A copy of the plan for this model is available for download from my plans page. 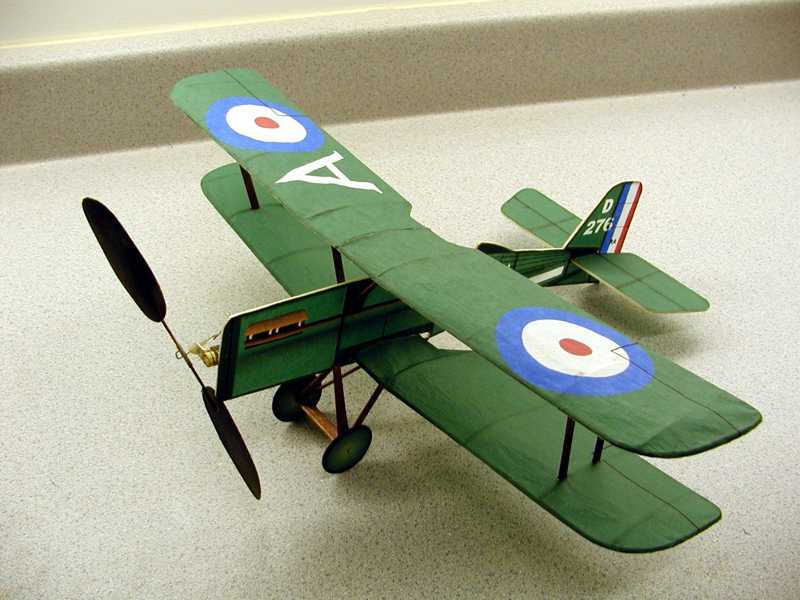 Model of the British Royal Aircraft Factory SE-5a. A copy of the plan for this model is available for download from my plans page. The No-Cal models are covered with light weight tissue paper. 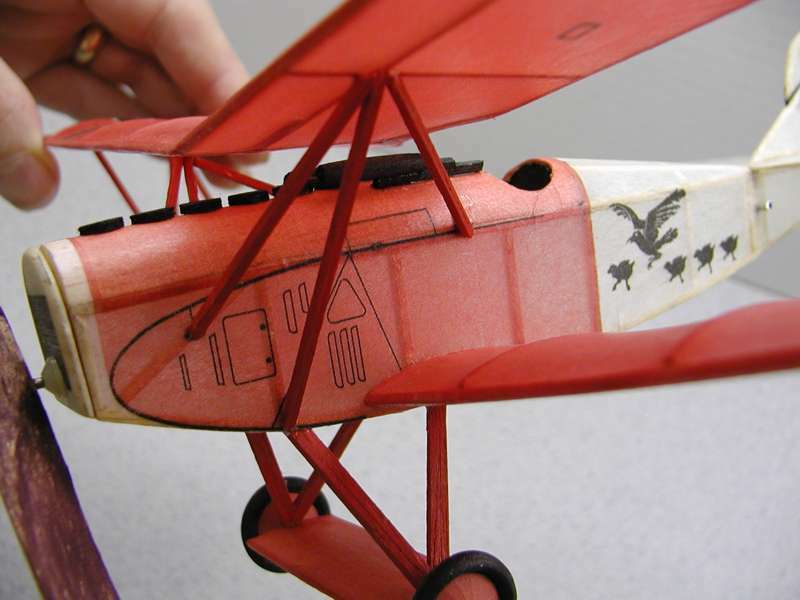 The color and markings on each model were printed directly on the tissue paper using a color ink jet printer. 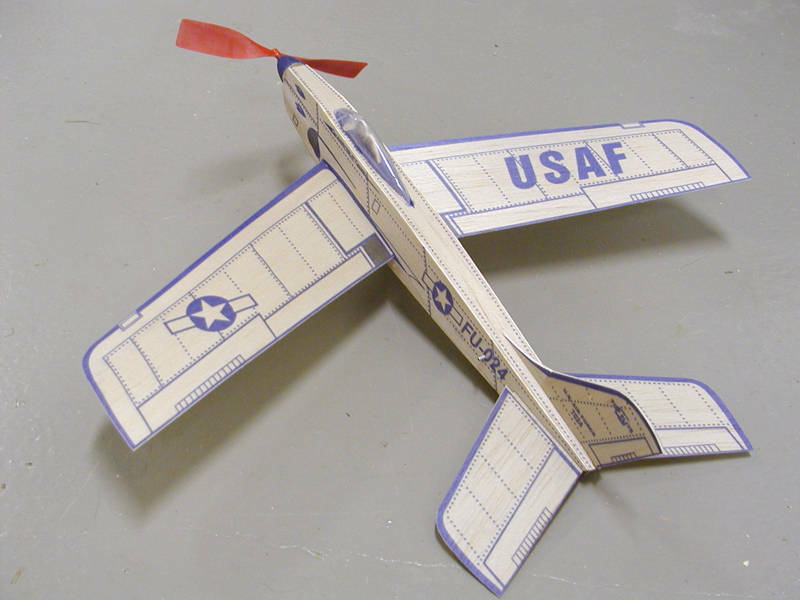 An article covering the process used for printing the tissue was published in the July 1998 issue of Flying Models magazine. Each of the models shown were built from my own plans. 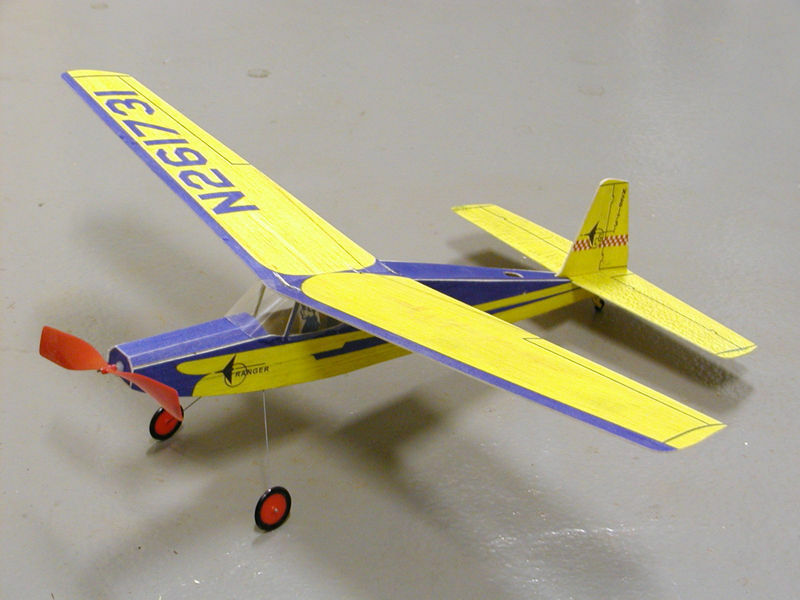 This is a small rubber powered model that is flown in competition under the Flying Aces Club (FAC) Embryo Endurance class. It is my own design. A copy of the plan for this model is available for download from my plans page. This is rubber powered model that was available in kit form a number of years ago from Jetco. It is the Jetco ROG (Rise Off Ground). It can be flown indoors, or outside on calm days. 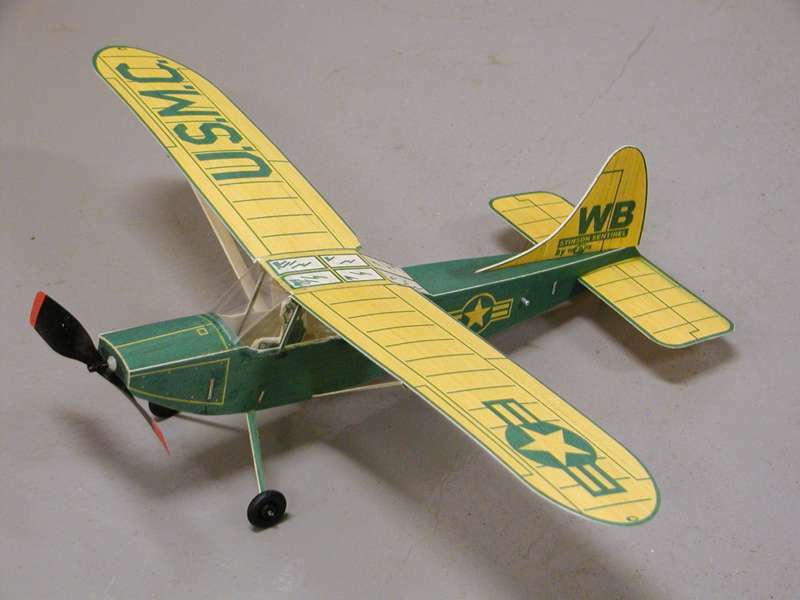 This specific model was built from plans and flown in a postal contest for people who participate in the Free Flight Mail List (FFML). See Thayer Syme's page for information on the FFML. 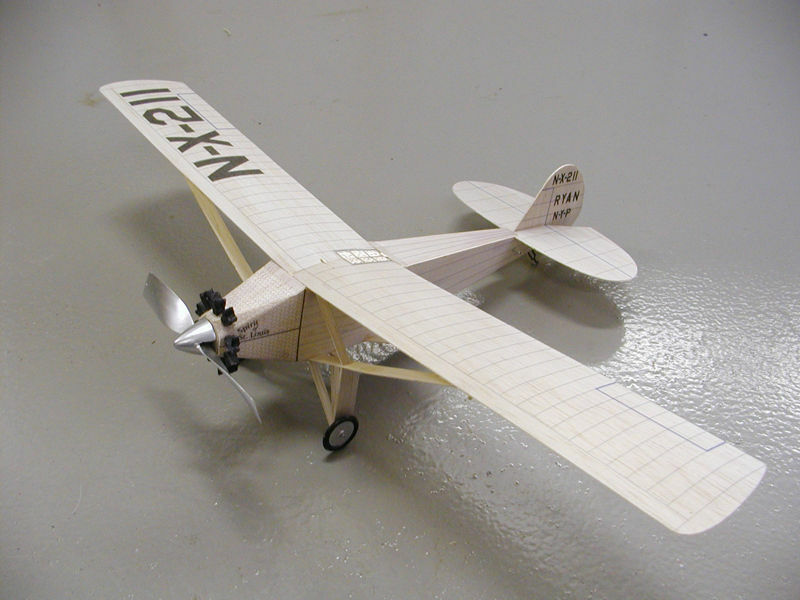 The model in the picture is covered with Lite Span and tissue paper with markings that were printed using a laser printer. This rubber powered model is called the Blatter "40". It was designed by Al Blatter and is ideal for either indoor or outdoor flying. It is well suited for people who are just getting started, and also for the more experienced builder. It is capable of flights in excess of 3 minutes when flown indoors. The model in the picture had the tissue covering printed with an ink jet printer. See Thayer Syme's page to download a copy of the plan for this model. 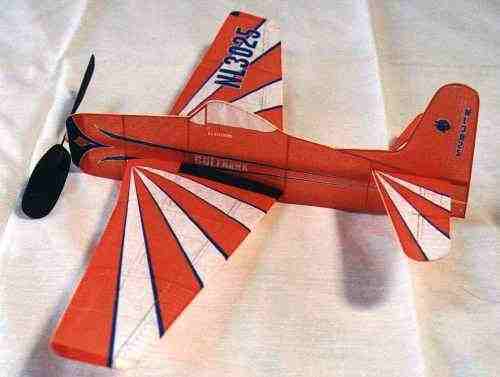 This is a Comet dime scale Fokker D-7. 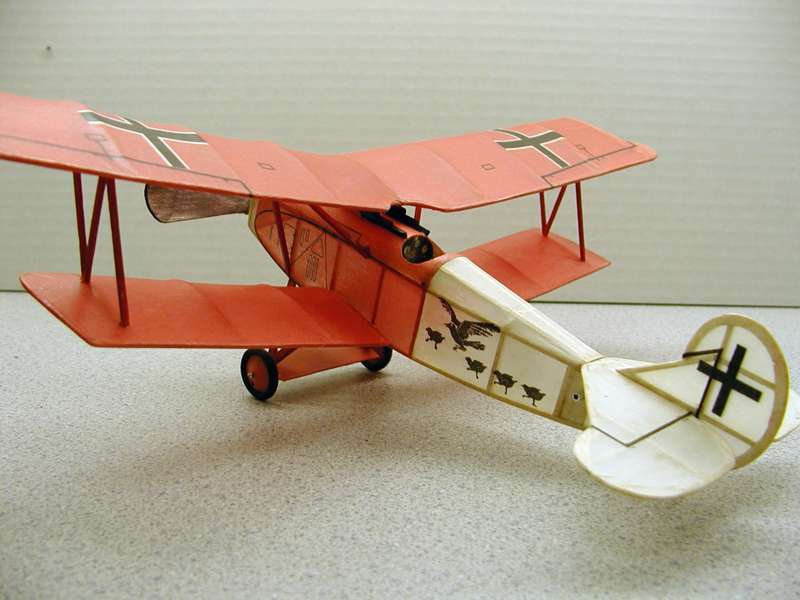 This model was built from a copy of the kit plan that appeared in the March-April 2005 issue of the Detroit Cloudbusters Newsletter. It is covered with Japanese tissue that has had the color and markings added with an ink jet printer. The wing span is 12 inches. The wheels were made using a 1/64" plywood disk with balsa tires. The tires were formed by turning the wheels with a Dremel tool. The wheel covers are bond paper folded to simulate the presence of spokes. 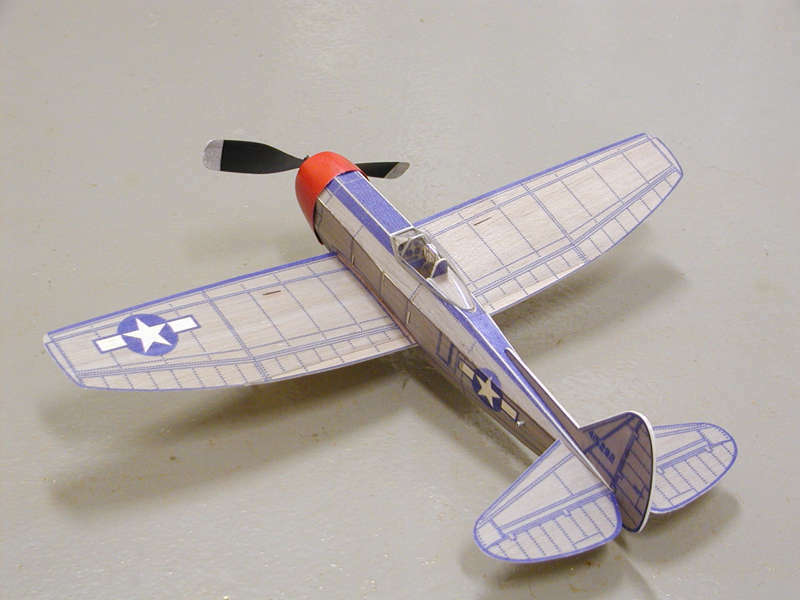 The propeller is carved balsa and the model flying weight less the rubber motor is 8.3 grams. 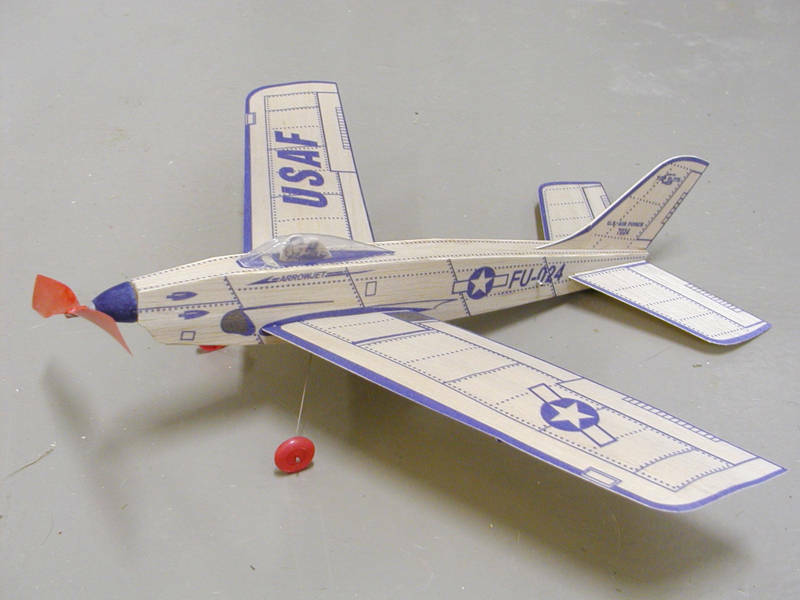 During the 50's and 60's Top Flite produced a series of all balsa rubber powered kits aimed at the beginning modeler. 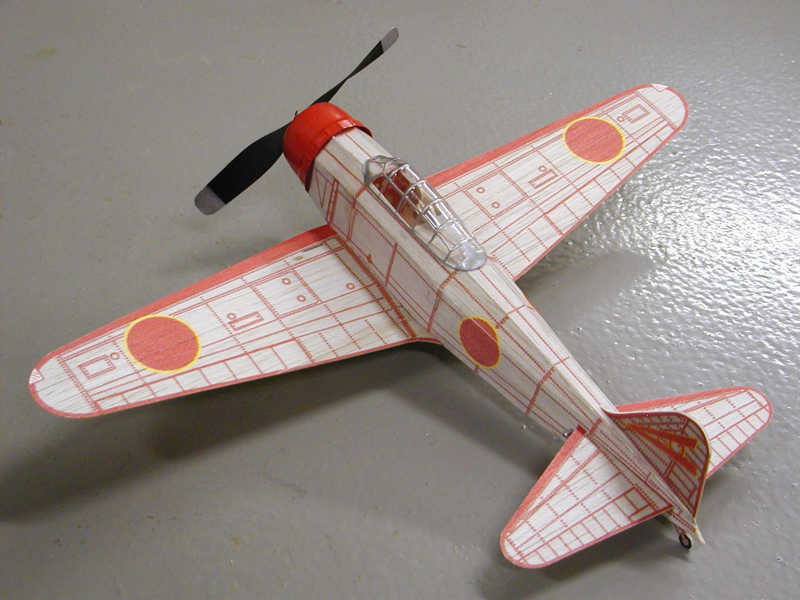 Their JigTime kits were guaranteed to fly and featured balsa parts with printed color and markings. The JigTime Rascal 18 got me started in this hobby way back in the early 50's. Designed by Carl Goldberg and long out out of production, I have always wanted one of these old kits. My brother and I were fortunate to find one on Ebay. Not wanting to actually build the kit, I decided to try to duplicate the model using an ink jet printer to print the parts directly on 1/32" sheet balsa. The effort was a success and I now have a very nice flying replica JigTime Rascal 18. 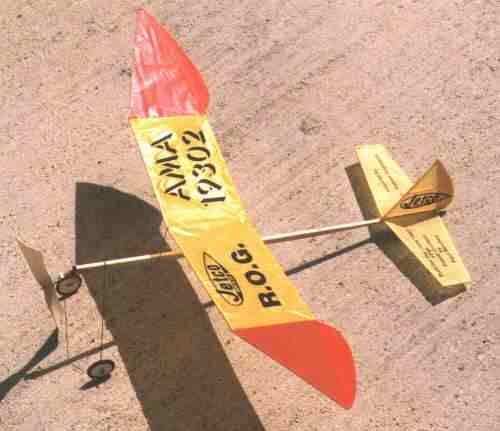 Oh yea, this model is the origin of the current R/C Rascal that is being offered by SIG. To see an R/C version of this model visit my electric R/C page. See the plans page for an Adobe PDF file containing the plan and parts templates for this model. 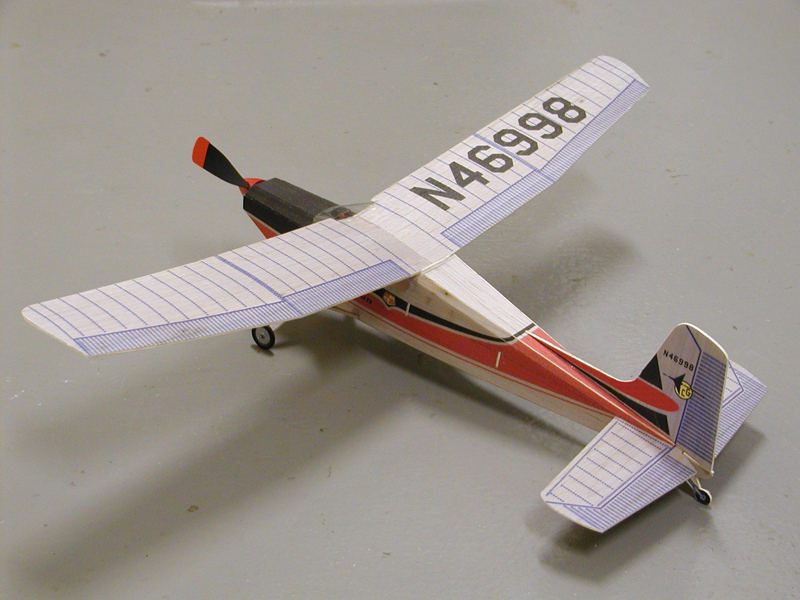 Continuing with my efforts to reproduce examples of the old Top Flite Jigtime series models, this is the Navion. It has a wing span of 16". 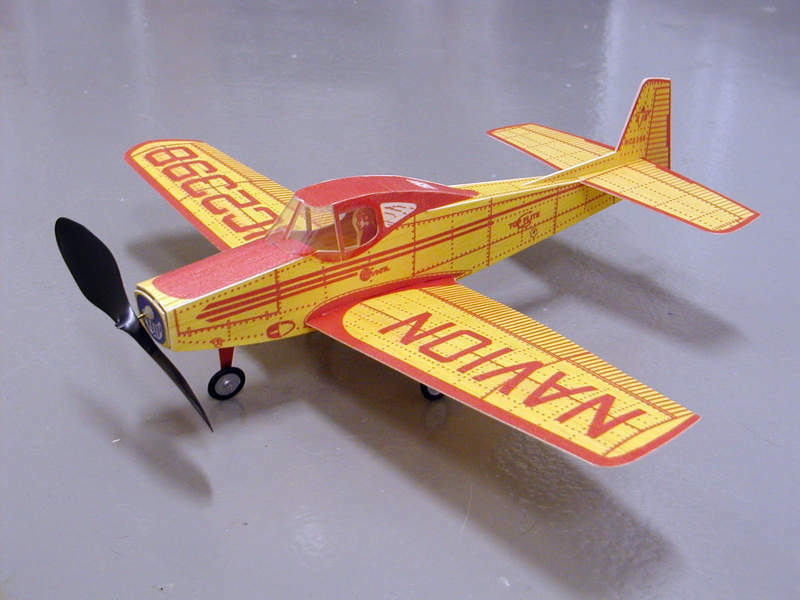 All of the color and markings were printed directly on the balsa using an HP 1120 ink jet printer. 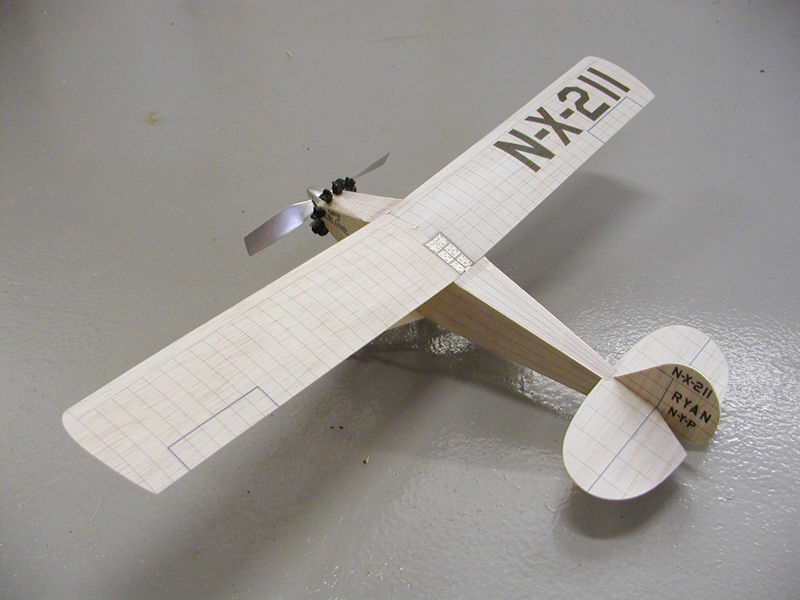 Construction is 1/32" balsa. 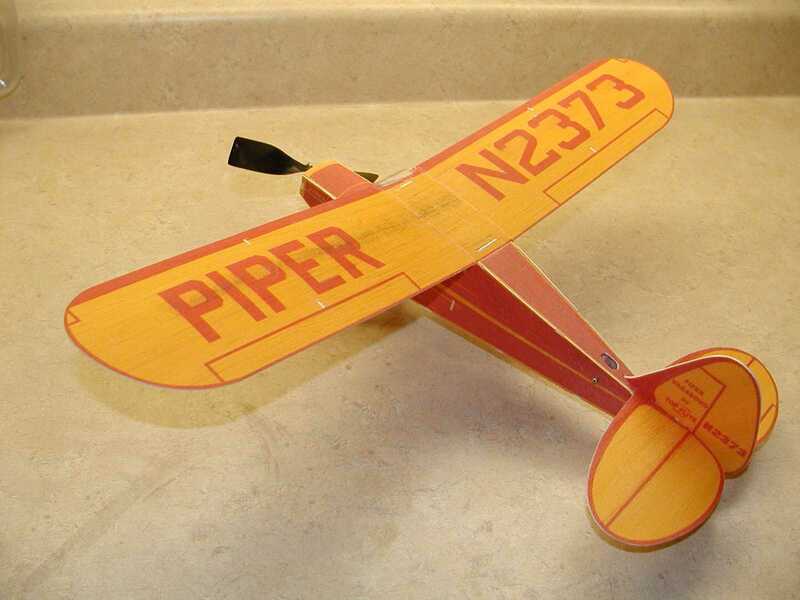 Another Jigtime model example is the Piper Vagabond. My reproduction shown here follows the same format of the others. 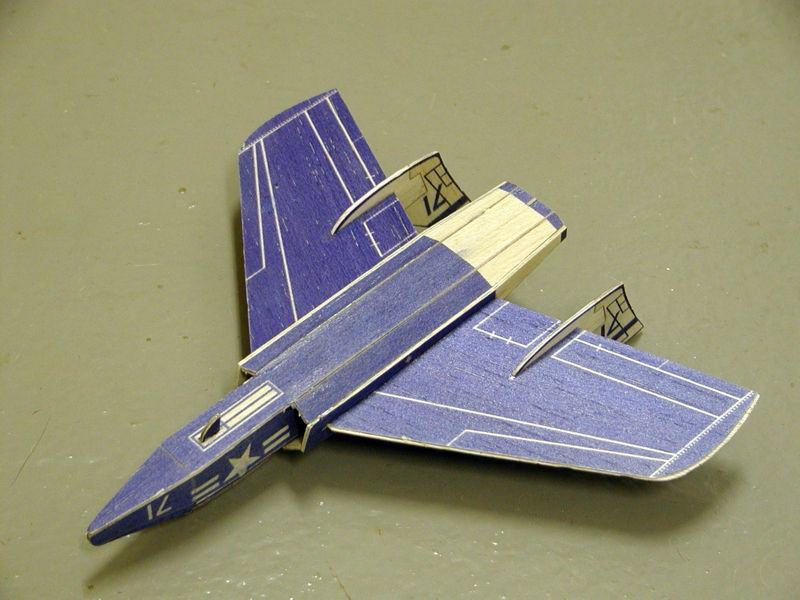 The color and markings are printed directly on 1/32" balsa using my HP 1120 ink jet printer. See the plans page for an Adobe PDF file containing the plan and parts templates for this model. This is a reproduction of the Top Flite Jigtime Luscombe. It is a very nice flyer as are all of the models in this series. 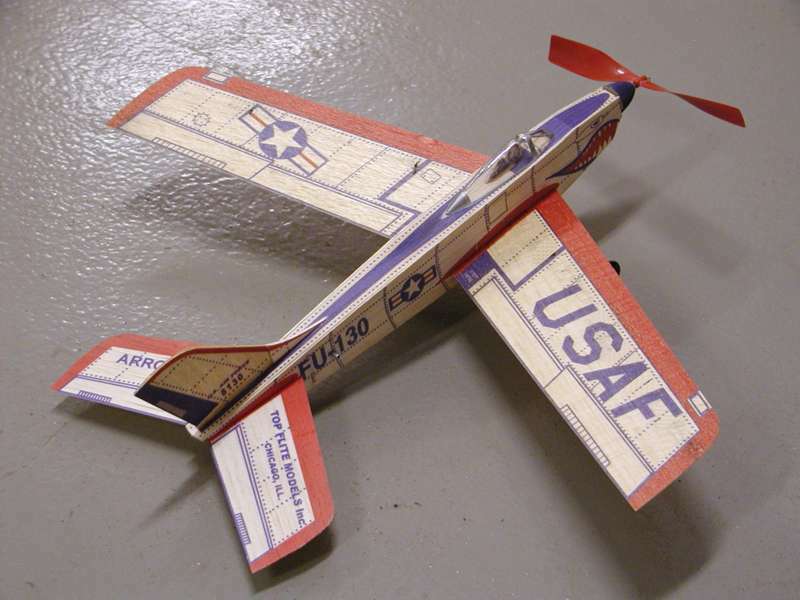 In fact, the original kits were guaranteed to fly by Top Flite or your money back. See the plans page for an Adobe PDF file containing the plan and parts templates for this model. 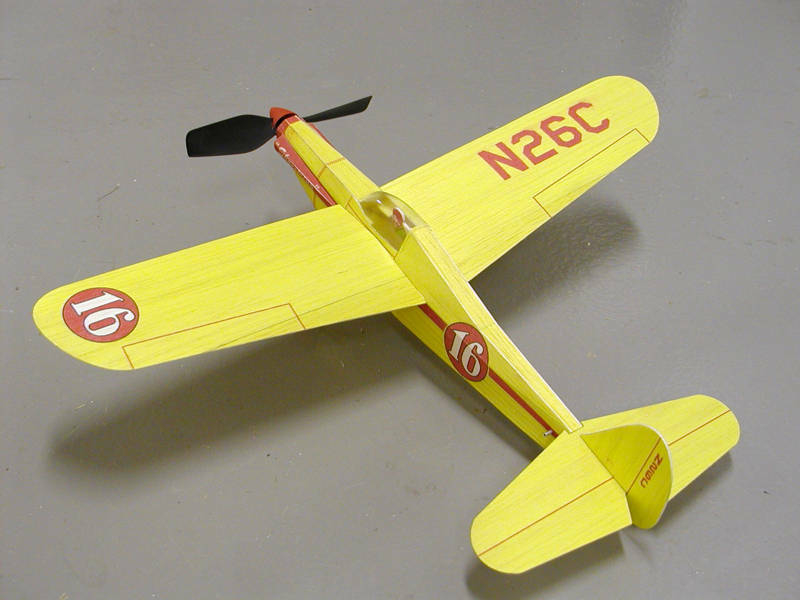 This is a reproduction of the Top Flite Jigtime Stinson Sentinel. . See the plans page for an Adobe PDF file containing the plan and parts templates for this model. 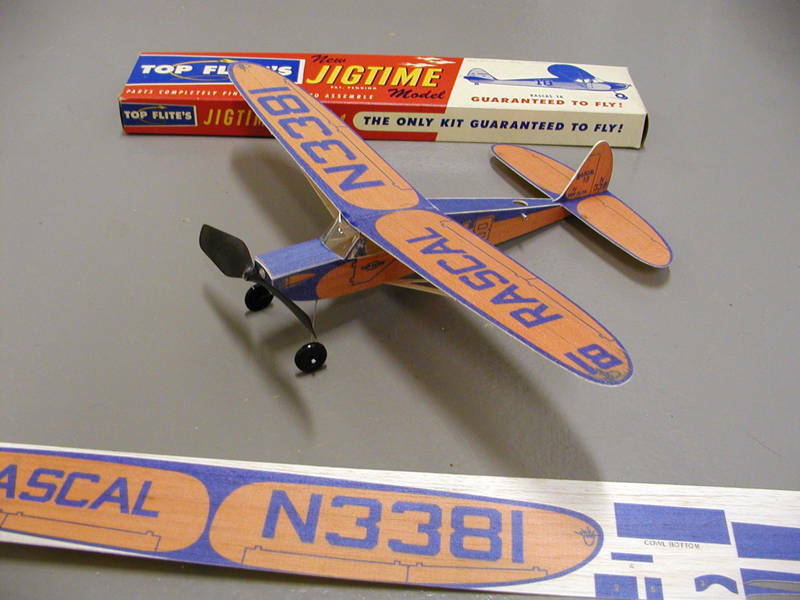 Within the Jigtime series there were two non-scale models that had the appearance of a full scale airplane. The Rascal 18 shown above was one and a model called the Arrow Jet was the other. The Arrow Jet is shown here. 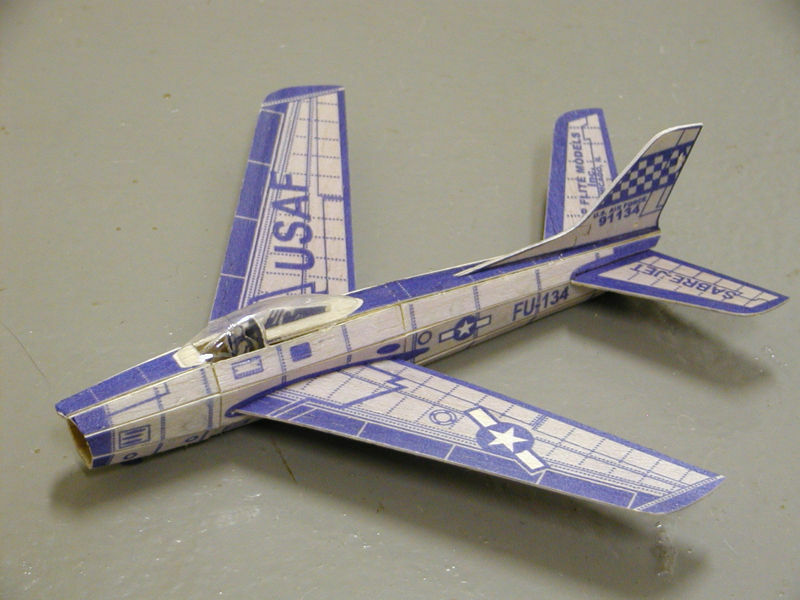 It has lines very similar to the North American F-86D. The colors used on this reproduction are somewhat of a guess as it was developed from a Duralume kit. 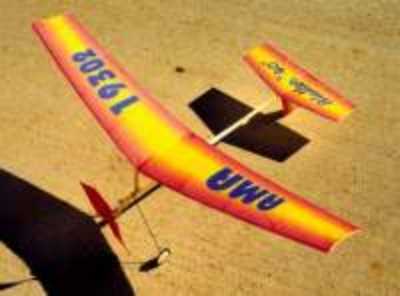 The Duralume series had the balsa covered with a thin aluminum foil. See the plans page for an Adobe PDF file containing the plan and parts templates for this model. Thanks to visitor Carl Godel I was able to receive scanned images of an original edition kit for the Arrow Jet. This allowed development of a reproduction of the original version as well as the Duralume version. See the plans page for an Adobe PDF file containing the plan and parts templates for this model. 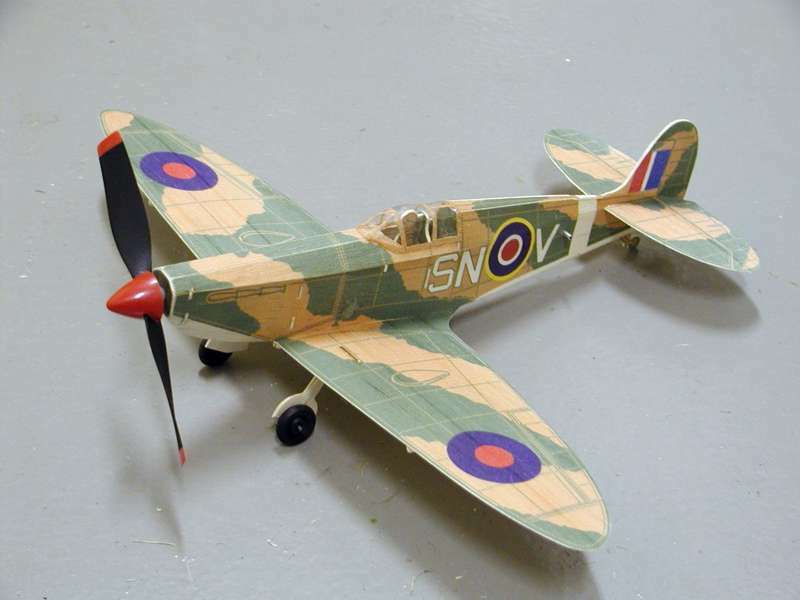 Following the introduction of the civilian and sport models in the Jigtime line, Top Flite added some World War II models. 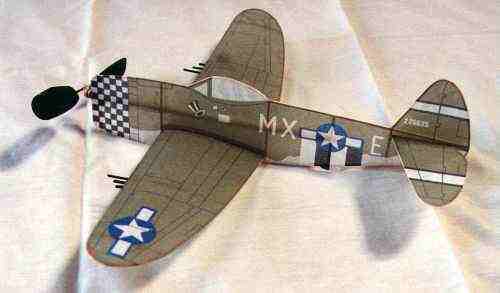 Pictured here is the Republic P-47. This model like the other in the series is a great flyer. The original kits came with a vacuum formed cowl and canopy. These parts were reproduced as vacuum formed pieces for the reproduction model shown. See the plans page for an Adobe PDF file containing the plan and parts templates for this model. Drawings for developing the vacuum formed parts are also provided. 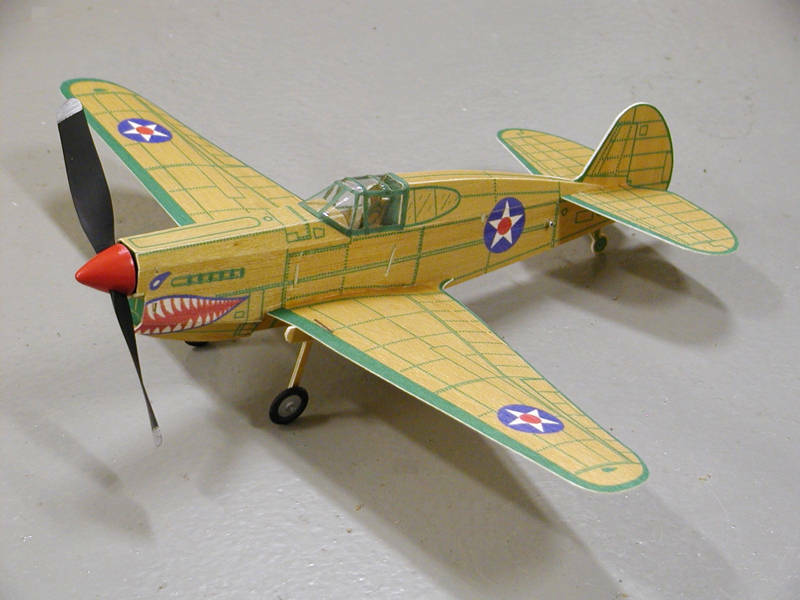 Complementing the P-47, Top Flite also had a P-40. The original kit included a vacuum formed canopy and injection molded spinner. For the reproduction model shown here, both parts were vacuum formed. See the plans page for an Adobe PDF file containing the plan and parts templates for this model. Drawings for developing the vacuum formed parts are also provided. 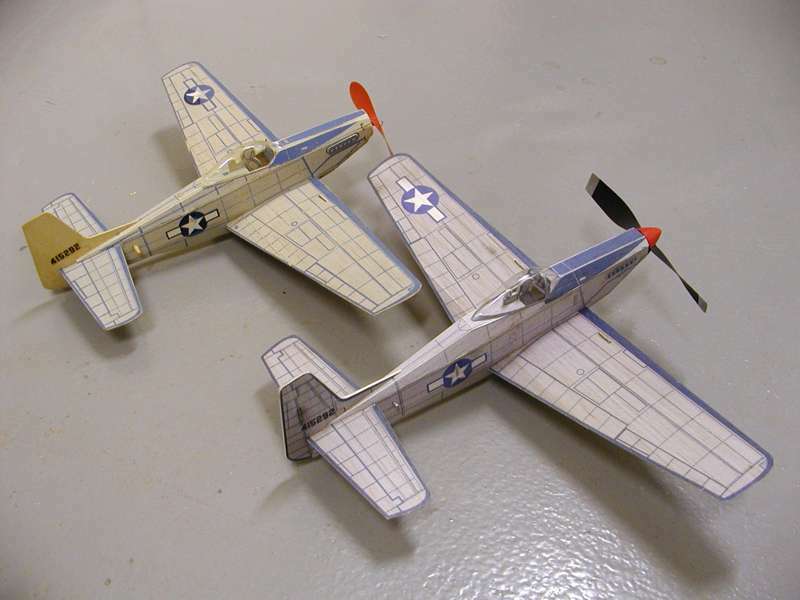 Continuing the Jigtime W.W. II model series is the North American P-51H. 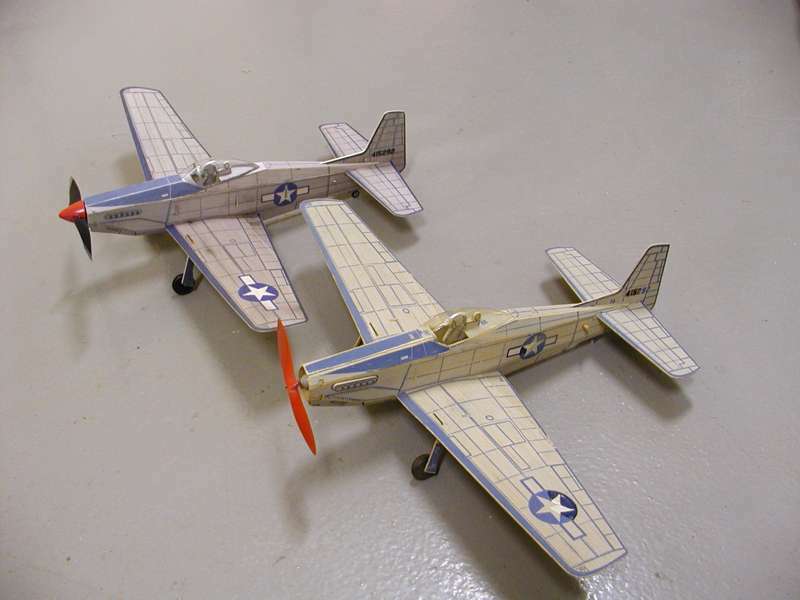 Thanks to site visitor John Hackert, I was able to borrow his P-51 that was built from an original kit. John's model is shown in the picture for reference. His is the model without a spinner (it was missing after years of storage). The original kits came with a vacuum formed canopy and injection molded spinner. The reproduction model in the picture had both parts reproduce using vacuum formed components. See the plans page for an Adobe PDF file containing the plan and parts templates for this model. Drawings for the vacuum formed parts are included in the drawing package. 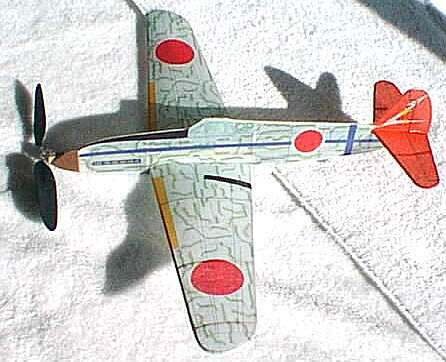 Included in the Jigtime W.W.II series was the Japanese Zero. Like the others in the series, the model did come with vacuum formed parts. For this kit the canopy and cowl were vacuum formed. The colors duplicate those of the kit model including the red cowl. See the plans page for an Adobe PDF file containing the plan and parts templates for this model. Drawings for developing the vacuum formed parts are also provided. 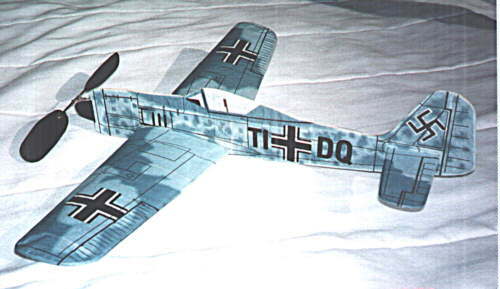 Representing another country's W.W. II fighter is the Jigtime Messerschmitt Me-109E. This model came with a vacuum formed canopy and injection molded spinner. The model in the picture had both parts reproduced using vacuum formed components. See the plans page for an Adobe PDF file containing the plan and parts templates for this model. Drawings for the vacuum formed parts are included in the drawing package. 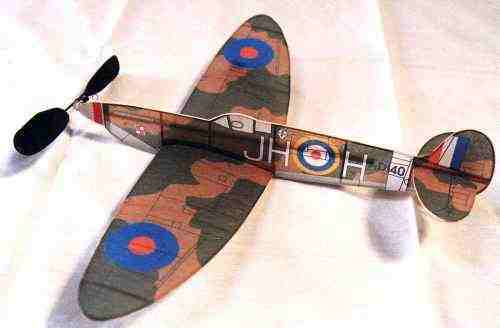 The final offering from Top Flite in their Jigtime WWII series models was the British Spitfire. Like the other WWII models in the series the kit came with a vacuum formed canopy and injection molded spinner. 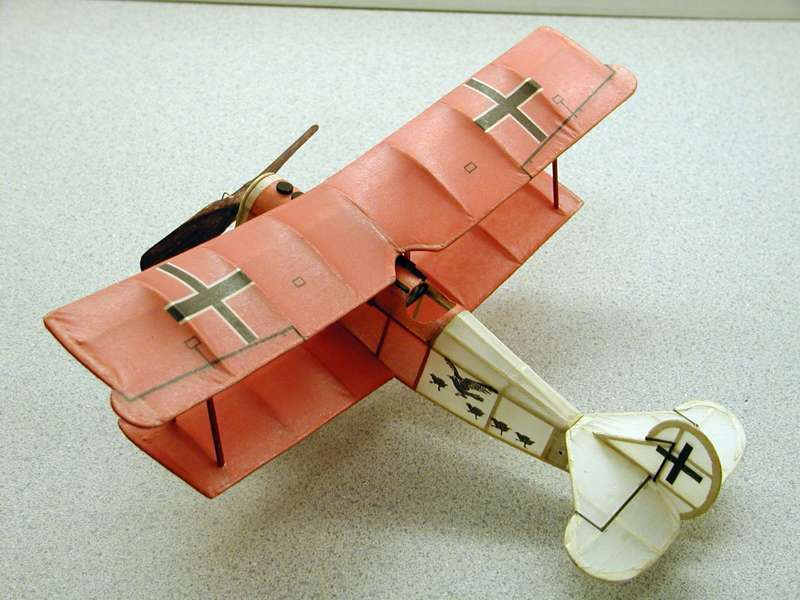 The model in the picture had both parts reproduced using vacuum formed components. See the plans page for an Adobe PDF file containing the plan and parts templates for this model. Drawings for the vacuum formed parts are included in the drawing package. The Jigtime series also included three very nice little catapult launched jet gliders. They had wing spans in the 8.25 to 9.5 inch range. Shown here is the Jigtime MIG-15. 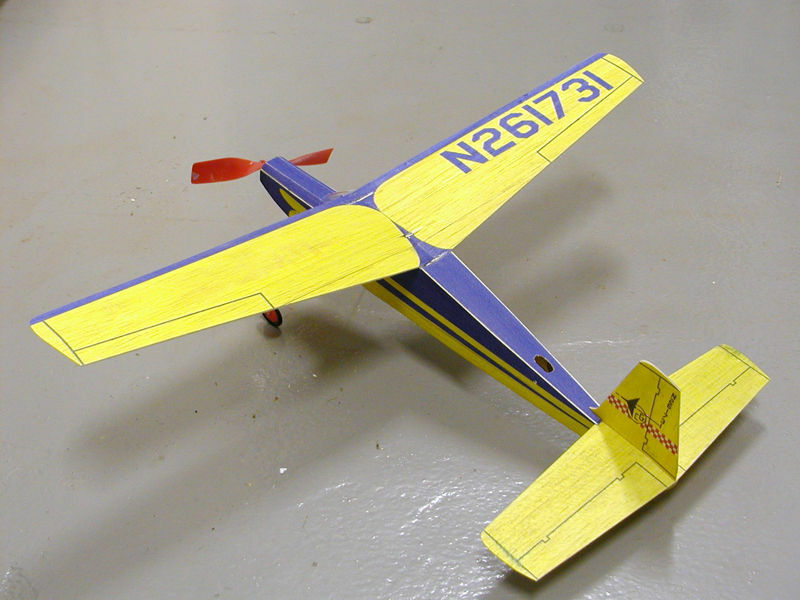 My Jigtime jet reproductions use two laminated layers of 1/32" balsa to form the parts. This allowed printing on both sides of the flying surfaces. 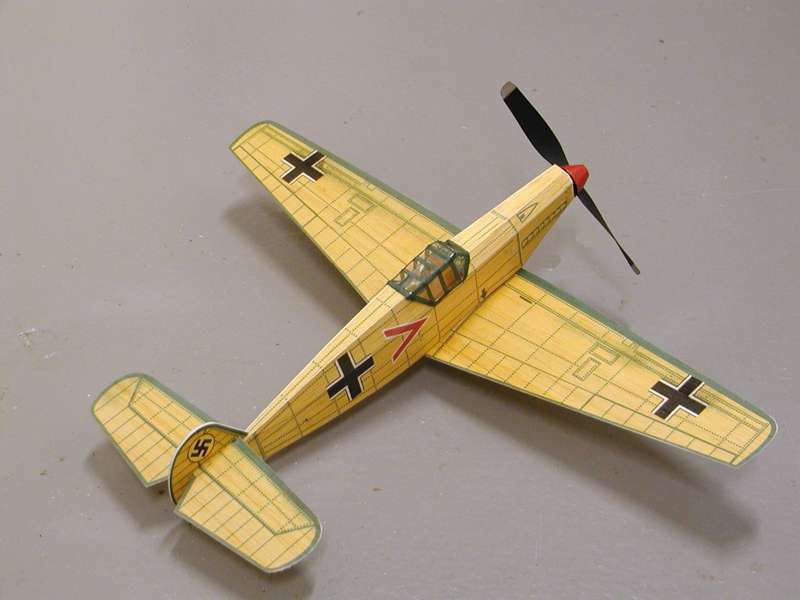 The original kits had printing on one surface and used 1/16" balsa. See the plans page for an Adobe PDF file containing the plan and parts templates for this model. Thanks go to Larry Renger for loaning me his kits to develop the reproductions. 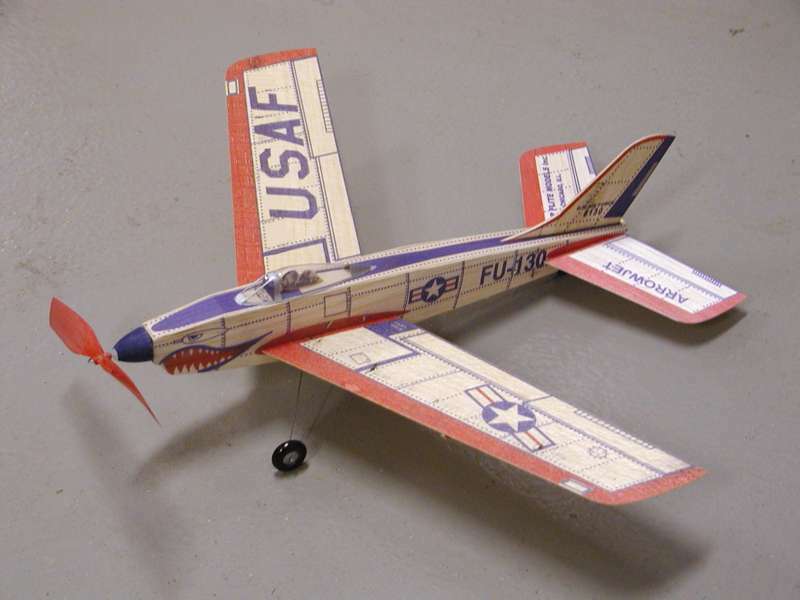 This is the North American F-86 Saber that was part of the Top Flite Jigtime jet series. See the plans page for an Adobe PDF file containing the plan and parts templates for this model. The third model in the Jigtime Jet series is the Chance Vought Cutlass. It is unique as a flying wing fighter. See the plans page for an Adobe PDF file containing the plan and parts templates for this model. While not a reproduction of a Jigtime kit, this is a reproduction of the Goldberg Shoestring. 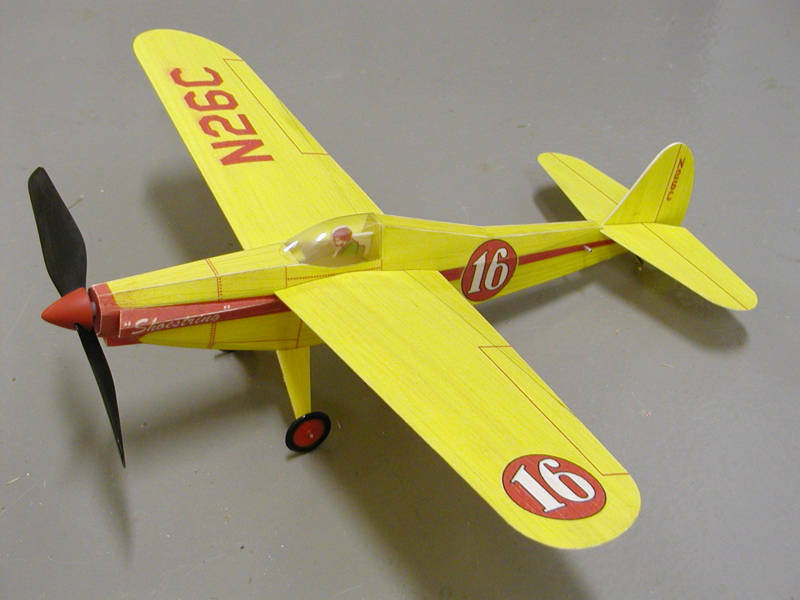 Carl Goldberg developed the Jigtime models while he owned Top Flite models back in the 50's. After he left Top Flite and started Goldberg Models he introduced a competing line of all sheet scale looking models. One was the Shoestring. 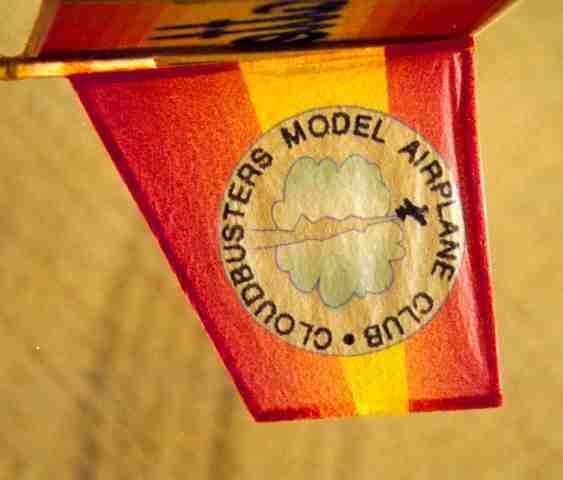 The Goldberg models did not have background color printed on the balsa. They had some lines printed, but no color. They were intended to be finished in color dope if the builder wanted color. Water slide decals were included in the kits for markings. 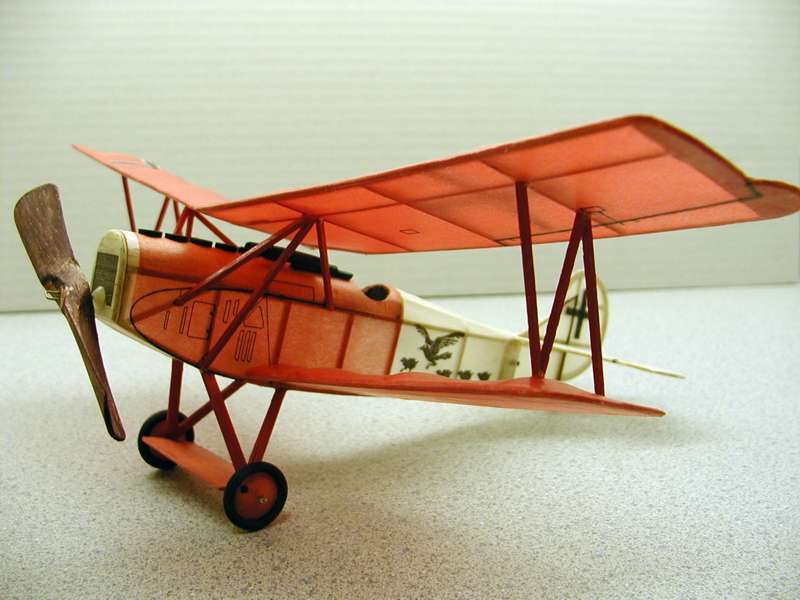 This reproduction had the color and markings printed on the balsa in the fashion of the Top Flite Jigtime models. The Shoestring is a very good flyer. See the plans page for an Adobe PDF file containing the plan and parts templates for this model. 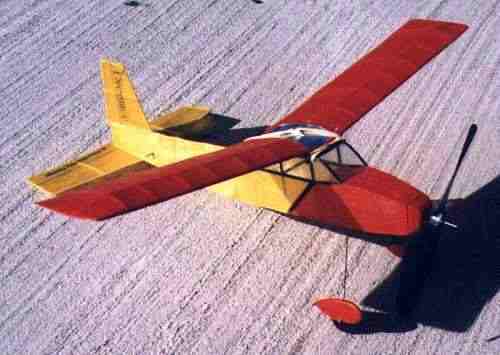 This is the Spirit of St. Louis from the Carl Goldberg line of all sheet rubber powered Free Flight models. 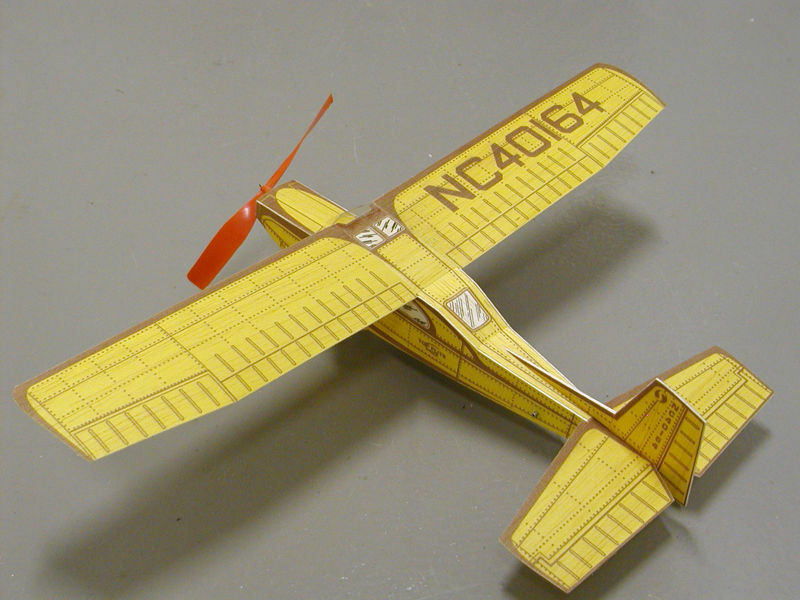 Like the Shoestring, color and markings were added to the printed balsa parts. 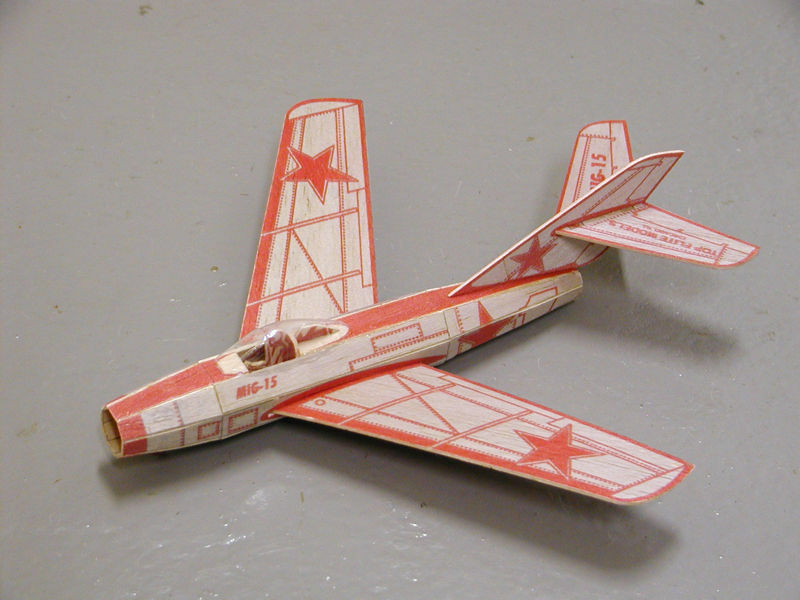 The original kits were bare balsa with a few reference lines printed. See the plans page for an Adobe PDF file containing the plan and parts templates for this model. 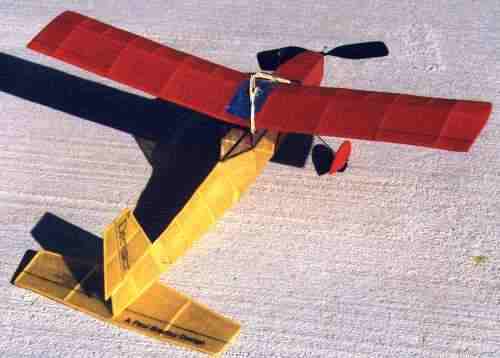 This is the Ranger 21 from the Carl Goldberg line of all sheet rubber powered Free Flight models. 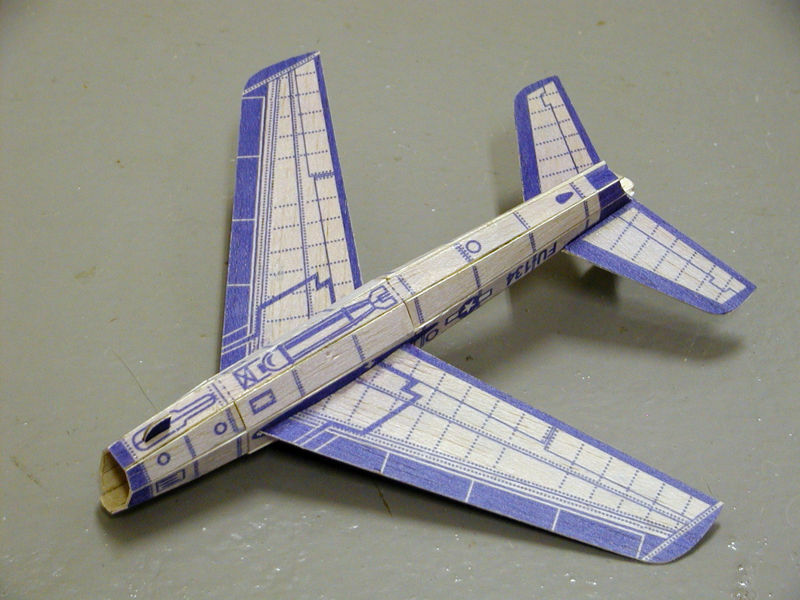 Color and markings were added to the printed balsa parts. 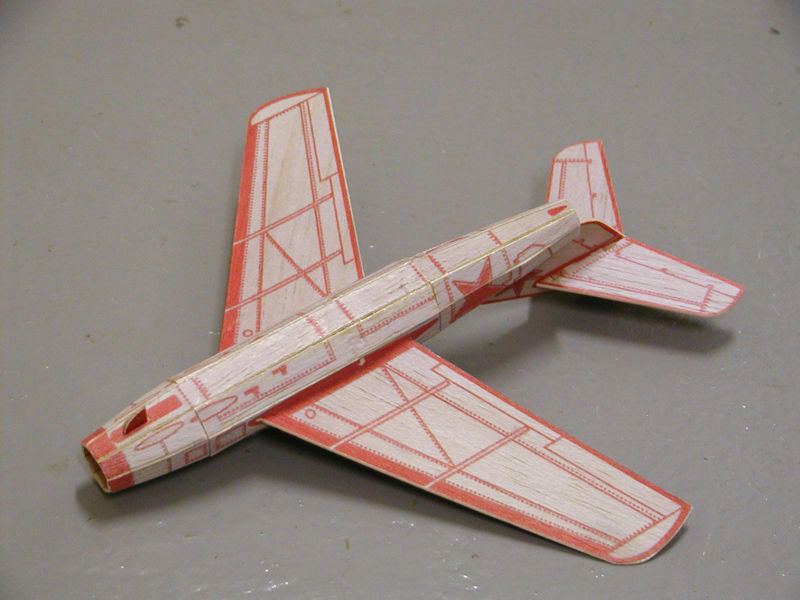 The original kits were bare balsa with a few reference lines printed. See the plans page for an Adobe PDF file containing the plan and parts templates for this model. 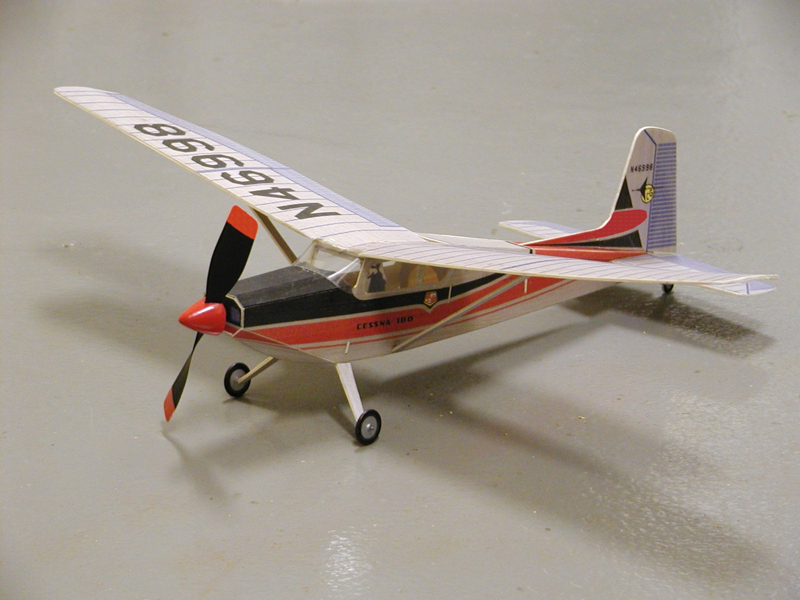 This is the Cessna 180 from the Carl Goldberg line of all sheet rubber powered Free Flight models. It has a 20.5" wing span. 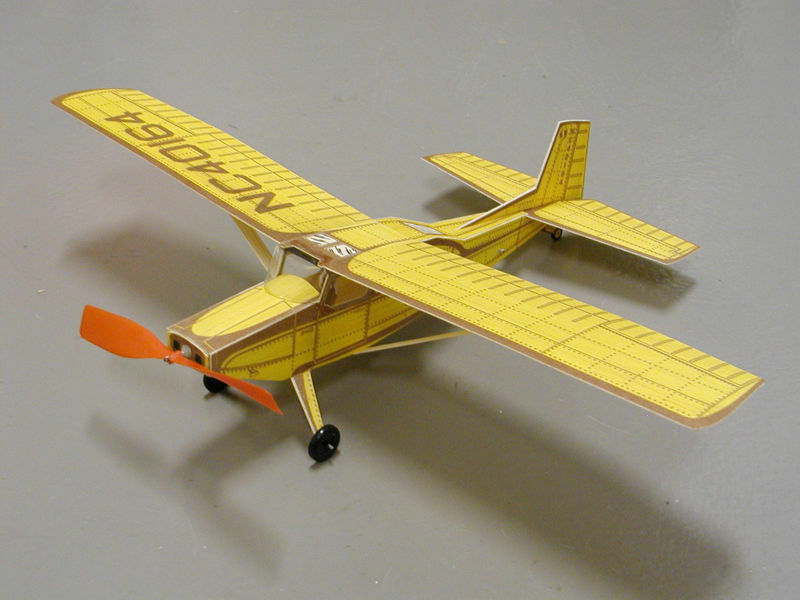 The color and markings are have been printed directly on the balsa using an ink jet printer. The markings are based on the kit box art. See the plans page for an Adobe PDF file containing the plan and parts templates for this model.